Akhilesh yadav and Mulayam singh yadav are sitting on different cycle just before upcoming election but good news for congress who was getting very few seats in Opinion polls. There are updates of Uttar-Pradesh politics that Samajwadi party of Akhilesh yadav can alliance with congress party in Uttar-Pradesh. Just after election dates have been declared all political parties are implementing there tactics and strategies on ground. Remember Samajwadi party is on the point of separation. Mulayam singh as a national president of Samajwadi party denied earlier about alliance with Congress party, whereas Chief minister Akhilesh yadav was keen to alliance with congress party and he had told every time that if alliance took place, Samajwadi party and alliance will win more than 300 seats. After disturbance within party ,Akhilesh supported Samajwadi party is ready to alliance with congress party. 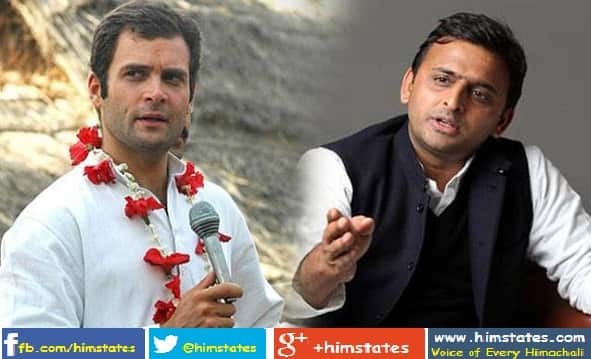 According to sources soon Akhilesh yadav can meet Rahul Gandhi in Delhi. According to sources after Rahul Gandhi and Akhilesh yadav meeting on 9th January , Priyanka Gandhi's suggestion will be taken on this issue. - If alliance took place , Samajwadi party will offer around 90 - 105 seats. After 7 phase election dates of Elections in UP , SP and congress are getting close and their is full possibility of alliance. The reason behind alliance of Congress and SP is to stop BJP to come in power. According to sources Samajwadi party and Akhilesh yadav didn't want to loose Muslim votes as they are sure that if alliance happen in Uttar-Pradesh , all Muslim votes will be shared to Congress and SP alliance. - Akhilesh yadav had said on several occasions that if alliance happen in Uttar-Pradesh , SP and alliance party will get more than 300 seats. - Congress have not cleared their stand on alliance issue but Akhilesh yadav is openly inviting congress for alliance. - Sheela Dikshit said she is ready to leave CM candidate post for alliance. - She said ,its good if two non-secular parties will ally together. - Sheela Dikshit also said , party is more important and she is ready to sacrifice her candidature. Today after many efforts of Aazam Khan, it is clear that there is very less chances to avoid Samajwadi party breakup. - Today Shivpal yadav and Amar singh met with Mulayam singh yadav . - Akhilesh yadav and Aazam also met with Mulayam singh yadav. But situation suggests that there is no hope of any patch up. - Ramgopal yadav said today that more than 212 MLA's are with Akhilesh yadav and they are real Samajwadi party. He also said that they will go to election commission to prove that they are real Samajwadi party and party symbol should be submitted to them. As news of possibility of Samajwadi party and congress alliance is coming political parties stated giving their views on this issue. BSP leader and spokesman said today that ,If this alliance happen this alliance will be of Gundaraj and Corrupt people. - Actually BSP is also thinking to loose their votes if this alliance happen, as BSP is trying to capture Muslim votes, In first two lists of BSP Candidates for elections , most of candidates are Muslims and from minority. BJP state president Maurya said that they are ready to face any alliance in state. He said they are ready for elections even if BSP, congress and SP alliance together. - BJP have no more option to say like this because they know , they have no chances of alliance with any party in state as all political parties in state are anti - BJP. Whole scenario about alliance is that if it happens it will be game changing for Samajwadi party who is fighting within family and congress party who is trying to make their appearance in Uttar-Pradesh.